We are a well-established, family-run and fully insured house removals company based in Corby, Northampton. Established in 2010, we have built an enviable reputation across Wellingborough, Leicestershire, Peterborough, Market Harborough, Kettering and Rushden for providing a fully insured home and office removals service of the highest standard. From full house removals and piano moves to single items of furniture, we are proud to offer a comprehensive service which is tailored to your needs. We pride ourselves on giving our customers a friendly, efficient, reliable House Removals service whilst always offering the best price possible. Why not take advantage of our packing service? Our removals team have years of experience helping home owners to pack their belongings so you can be sure of careful, meticulous packing which helps to lift the strain from your shoulders. 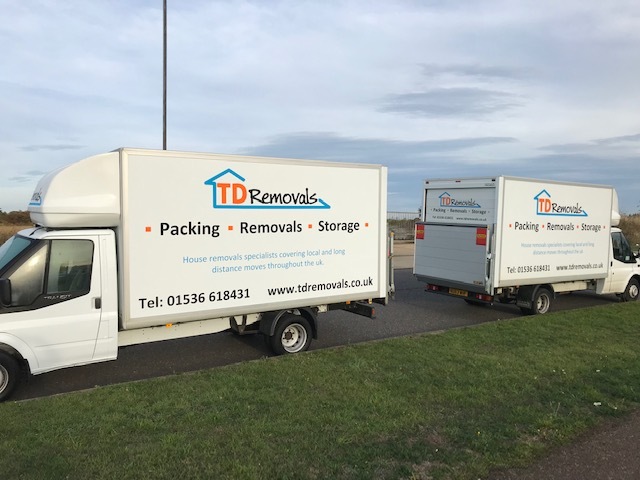 At TD Removals, extras come as standard, we are here to make your house move as easy and stress free as possible and nothing is ever too much trouble for our professional, friendly team. We cover the whole of Northamptonshire and Leicestershire and we can also cater for long distance house moves. If you are looking for a removal company in Kettering, Corby, Market Harborough, Wellingborough, Northampton or even our long distance house move service, then please fill out our online enquiry form. If you are packed up but find yourself between properties, give yourself peace of mind by keeping your items in storage during your house move. We provide secure storage units to keep your possessions safe if required, please go to our storage page for more information. Still not convinced? Take a look at what our customers have said about our Removals Company and our friendly team on our Testimonials page. "I would just like to say that the guys that moved me were very professional. I have moved 13 times and this time it was stress free.Thanks guys, I would certainly recommend you." - Louise Gough. "Similarly to the last time I moved, Daniel and Mark were absolutely brilliant. They could not have been more helpful and were continually cheerful and positive. I would use them again with pleasure. Thanks!" - Harriet.